With all the 3D drawings we use today, a craftsman who spends his whole life doing a few simple operations has little chance of exercising his intelligence and thus corrupts the spirit of his mind. These books are for anyone interested in learning the geometric process to roof framing that can be used on the jobsite. As well as the trigonometric formulas that have evolved from the geometry. A lot of the geometry in the books will be the first time there’s an English explanation to the geometric drawings. French Art du Trait and German Shiften drawings are intellectual exercises in three-dimensional lines. However, precise rafter layout can only be accomplished with knowledge of the geometry that develops the parallelogram in the compound joint. Most roofs can be calculated with a CMC calculator. For complex roof framing, trigonometry or geometry must be used. There is more trigonometry in this book than all of the roof framing books written in English combined. 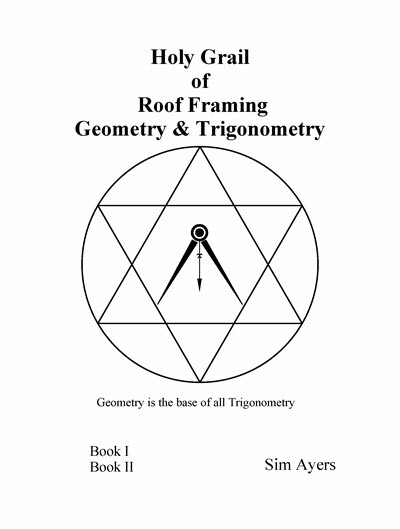 However, it has over 1,000 geometric roof framing drawings in the book as well, for carpenters that are not comfortable using trigonometry. This book does not fit in your sisters' lunch pail. It was written to make complex roof framing simple. 5 different techniques to cut the Witches cut. Roof framing base knowledge starts with geometry, not the CMC calculator. Precise rafter layout is accomplished with plumb lines and level lines. Grasshopper method for devers - canted hip rafters. Precise rafter layout can only be accomplished with knowledge of the geometry that develops the parallelogram in the compound joint. Take away the carpenters Framing Square, CMC calculator, and circular saw to show you what they really know about cutting rafters. Can they still layout and cut a hip rafter without the use of these tools? These books will help you acquire the knowledge that has been passed down by the builders of the past. The information shown in some roof framing books can be overwhelming. My primary objective in writing these books is to share the knowledge I've gained from reading and studying books on roof framing. It's easy to think you know everything about roof framing, big fish in a little pond syndrome until you see or examine the roof framing from around the world and from the builders of the past. I'm as guilty as anyone on the big fish in a little pond syndrome, roof framing in the San Francisco Bay area during the height of conventional roof stick frame era, before roof trusses. Now that I've studied a lot of geometry and trigonometry, I know that using the Pythagorean theorem in the 1980's was like taking bunny steps compared to what I know and can do now. 3: Roof Surface - Sheathing Angles. All of the roof framing angles we use are based on these three angles. For plumb hip rafters, the hip rafter backing angle and roof sheathing angles define the cut on the timber. For canted rafters, the valley sleeper layover bevel angle and roof sheathing angles define the rafter cuts for canted rafters. Hip rafter shift - offset, plumb line shift, DP-shadow line, and roof averaging design are the other four techniques that need to be studied-learned to graduate from the big fish in a little pond to compete in the world skills of roof framing. There are other areas in the roof that need to be studied, but these seven angles-techniques should be the base for all roof framers. Don't re-invent the wheel, like I've been guilty of, learn these seven angles - techniques. That has been passed down through the centuries. The builders of the past have made it pretty easy for us. All we have to do is study the techniques that they used from the middle ages to the present day. And we get to use circular saws, instead of broad axes, handsaws, draw knives, chisels, Bisaiguë, etc... to cut our rafters.